image from page 2 of Sales Clipper, Vol. 18, No. 2, Feb. 1960. Caption reads: "Two Dozen to One: It takes 24 Steyr Fiat 500 automobiles to equal the wingspan of a DC-7C, Walter Onken, DTSM, Vienna, proves. He used this device to dramatize speed fuel consumption and other characteristics of the Super-7 Clipper to the Austrian press. The facts and photo received a wide coverage in the press." 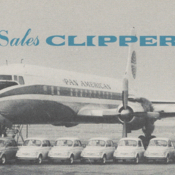 Pan American World Airways, Inc. , “Photograph of a DC-7C airplane behind two dozen Fiat cars illustrating the massive wingspan of the aircraft,” UM Libraries Digital Exhibits, accessed April 22, 2019, http://scholar.library.miami.edu/digital/items/show/1798.